Whatever model of Dyson vacuum cleaner you have, whether it’s a DC11, DC14 or DC24, maintaining your Dyson filters in peak condition is vitally important to ensure the correct function of your appliance. A blocked Dyson filter can lead to overheating and eventual motor failure so if your filters have seen better days we recommend you buy a replacement Dyson filter. 4YourDyson stocks both Dyson pre-motor and post-motor filters for the full range of vacuum cleaners including the DC01, DC02 all the way through to the DC50. Our simple Dyson parts finder makes it easy to locate the part you want and with 4YourDyson you know you are guaranteed great value prices. Cleaning the filter of your vacuum is vital to its ongoing performance. When the filter becomes clog.. This item is a genuine spare part for your Dyson DC14 vacuum cleaner ..
Are you struggling to filter what your vaccuming? you may need to replace the filter, and in that ca..
A genuine Dyson spare part for Dyson DC33 vacuum cleaners. This replacement Dyson DC33 HEPA filter w.. Pack of 2 compatible Dyson DC02 H-level filters for Dyson DC02 model vacuum cleaners. 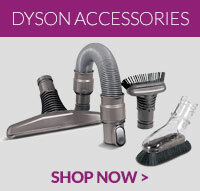 These Dys..
Dyson Filter Kit H Level Washable DC05 Cleaning the filter of your vacuum is vital to its ongoing.. This item is a spare part compatible with Dyson DC14 vacuum cleaners ..
Genuine Dyson DC40 filter for your Dyson DC40 vacuum cleaner. ..